Want to get clear on your financial position? Book your complimentary review. Received a large sum of money? By taking some practical steps, you can make sure your newfound wealth goes a long way. Windfalls such as salary bonuses and inheritances are more common than many people think. An Australian survey showed that 85% of seniors are likely to leave an inheritance for their children, with an estimated $3.3 trillion pledged1. While coming into a large sum of money seems a good opportunity to build a secure financial future, research has shown that on average, people who receive an inheritance spend about half of it2. So how can you avoid blowing your newfound wealth? Here are some smart ways. To avoid the temptation of spending the money impulsively, you could put it away temporarily in a deposit account or short-term investment instrument. If you leave the sum aside for one or two months, it will give you more time to plan or engage a professional financial adviser to help you decide how to use the money wisely. Using your windfall to clear your debts can put you on a better financial footing. Consider working with your financial adviser to create a budget that considers all your debt obligations, income and windfall. This can also be a good chance to discuss the opportunity to invest and grow your money. Building up your emergency fund – or creating one if you haven’t already done so – can be another way to make good use of your money. By increasing the fund to cover your expenses for six months, you may be better positioned to handle unexpected events such as a job loss or unforeseen medical costs. Making extra contributions to your superannuation may help you optimise your windfall. Whether you make non-concessional contributions or, if you are employed, arrange to have a portion of your pre-tax salary paid to your super, increasing your retirement savings can help you secure your financial future. You may also take this opportunity to build your savings for some of your dreams, such as pursuing higher education or travelling to places on your bucket list. But consider doing this only after you’ve paid off your debts and built up your emergency fund. Receiving a large windfall can be a chance to help others in need. If the money came from a loved one, donating some of it to charity may be a good way to honour their hard work to build that bequest. If you decide to give away some money, consider donating it to an organisation that’s entitled to receive tax-deductible gifts, so you can claim a tax deduction. Don’t forget to keep records of your gifts to give to your accountant at tax time. 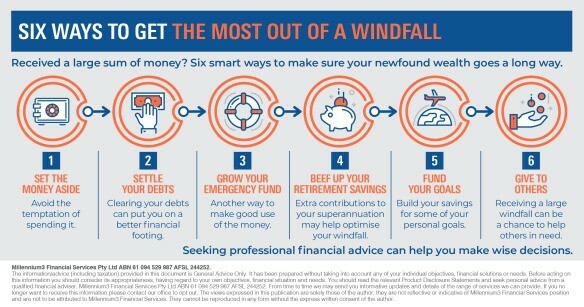 Getting professional financial advice may help you optimise your windfall. Your adviser can review your finances and work with you on a financial plan based on your needs and priorities, to help you achieve your goals. 1 The Australian Seniors Insurance Agency, January 2018, ‘Inheritance Survey’. Available at: https://www.seniors.com.au/news-insights/inheritance-retirement-survey. 2 The Ohio State University, 2012, ‘Most Americans Save Only about Half of their Inheritances, Study Finds’. Available at: https://news.osu.edu/most-americans-save-only-about-half-of-their-inheritances-study-finds—ohio-state-research-and-innovation-communications/. The views expressed in these publications are solely those of the author; they are not reflective or indicative of Millenium3 Financial Service’s position, and are not attributed to Millenium3. They cannot be reproduced in any form without the express written consent of the author. Australian residents only. KGH Financial Pty Ltd trading as Leading Advice ABN: 52 146 015 885 is a Corporate Authorised representative of Millennium3 Financial Services Pty Ltd ABN: 61 094 529 987 Australian Financial Services Licensee No. 244252. | 347 Kent St, Sydney NSW 2000. This information (including taxation) is general in nature and does not consider your individual circumstances or needs. Do not act until you seek professional advice and consider a Product Disclosure Statement. © 2018 Leading Advice. Site by Launchpad Marketing.